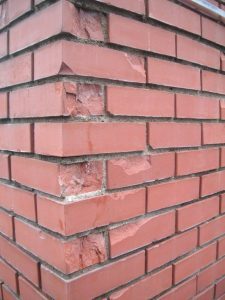 Home / Freeze Thaw Damage In Bricks And Concrete: How To Prevent It. What Does Freeze Thaw Damage Look Like? What Causes Freeze Thaw Damage? Freeze-thaw damage happens to a porous material when it has absorbed water and then the temperature drops below freezing, and the water turns to ice. Have you ever noticed the ice-cubes in your refrigerator? They are mounded-up a bit in the middle. That is because water expands in volume as it changes from liquid water to solid ice. In an ice-cube tray there is room (above) for volume expansion, and so no harm is done. 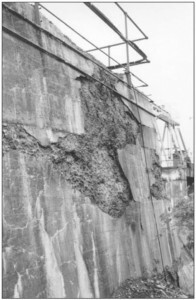 When the water is absorbed into the porosity of concrete, and then cold weather brings about freezing, there is no elasticity in concrete, and so the water literally breaks the concrete as it expands. 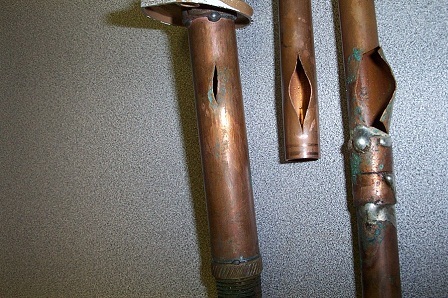 This is why water pipes are ruptured if the water inside is allowed to freeze. 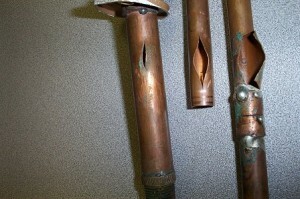 The same force that explodes the metal pipe destroys the concrete or brick surface. 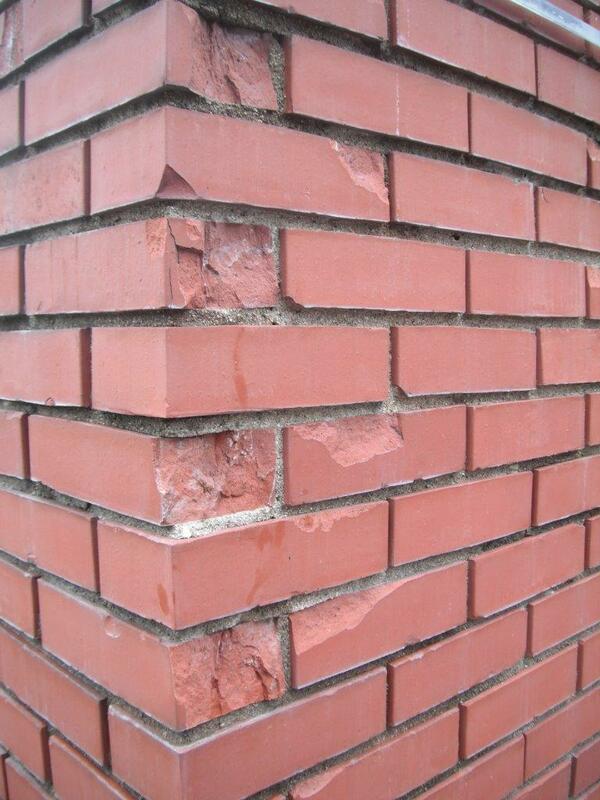 How Does Freeze Thaw Damage Occur In Bricks And Concrete? 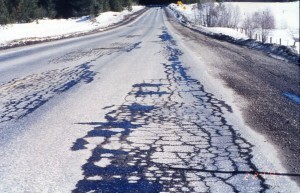 The pock-marked driveways in front of houses in cold climates, the thick flaking of bricks or stonework on the outside of houses in these areas, are evidence of this deterioration. While the damage is caused by water freezing, it is called freeze-thaw damage because it happens more often with the daily freeze-thaw-freeze-thaw-freeze cycles wherein the winter sun comes up in the morning, warms and melts a layer of snow on the outside of [for example, the chimney on a house in Colorado], the water soaks into the brick or stonework, the sun goes down at the end of the day, the night-time temperature drops below freezing, small cracks appear as the water turns to ice, the sun comes up the next morning, warms the surface, the ice in the crack melts, more snow-melt runs into the crack, the sun goes down, the water freezes and expands and the crack gets bigger. This cycle can continue until pieces fall off of bricks, and can continue until structures disintegrate. 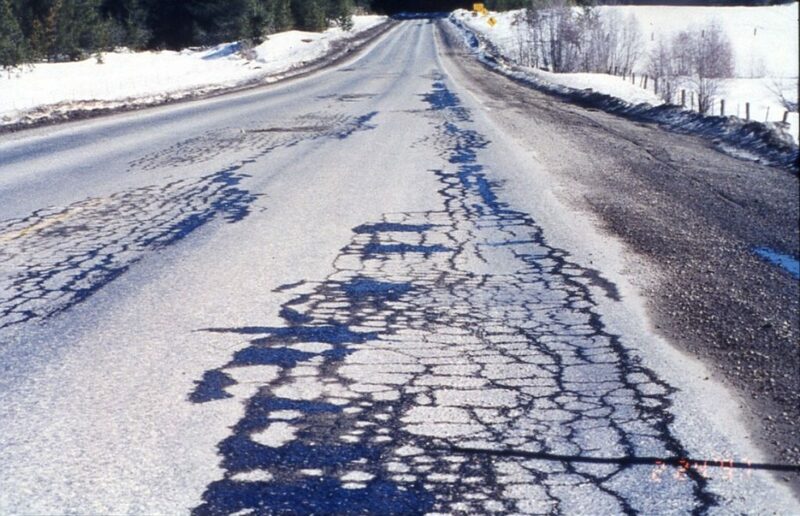 For roadways, bridge decks, airports and structures that are already built, it is important that disintegration not happen. 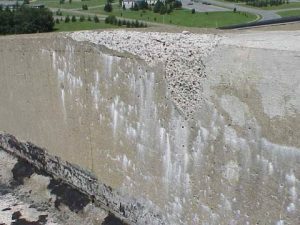 If you search the Internet for information about freeze-thaw damage protection, one thing you will find is the idea of making the concrete with air whipped in before the concrete cures. This provides a bit of “give” to the concrete, and can help it resist this kind of damage. However, concrete is porous, and water can get into these “air-bubbles”. Most concrete is not made this way, and we need to protect concrete that is already in-place, and was made in the usual way. This leads us to look for products that can be applied to existing concrete. Here’s the challenge. 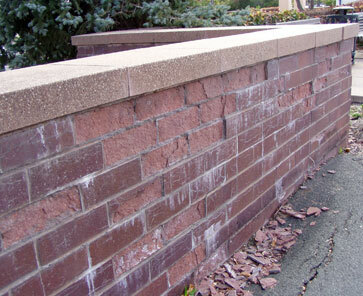 Freeze-thaw damage can be prevented if the water can be prevented from freezing. That sounds impossible, since when the temperature goes below the freezing point of water, then water freezes, right? There are things that can be done to help water resist the transition from liquid water to solid ice. The Physics behind this is complex, and there are of course trade secrets involved in the mechanism of action of the various treatments. Can be applied to Wet Concrete, but better results will be achieved if the concrete is not wet. Least Labour Intensive to apply. Most Expensive, typically £1 – £2 per square foot, £10 – £20 per square metre. Lease application effort, but skilled careful application required. This product is described in great detail here. Only the Permanent Concrete Sealer can be applied to Wet Concrete. 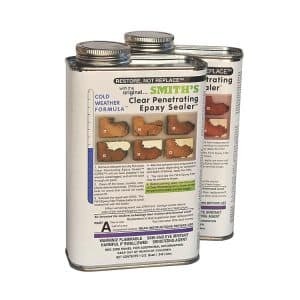 The other two products are solvent based, and require a dry substrate to be absorbed. The simple rule is that to get a product into a substrate, there has to be space for it, a saturated substrate is already full. If the Concrete is dry, then it has lots of empty space for the product to be absorbed. The temperature has to be above freezing, both night and day, for any of these products to work.